Advance and protect the interest of its members (owners of immovable property). Regulate the environment, with particular focus on safeguarding and environmental management. Control and co-ordinate development through the Design Review Panel, with reference to aesthetic standards, design, contractor management and signage review. Provide, promote and maintain essential services, amenities and activities. This is achieved through the protection, promotion and maintenance of essential services, amenities, and activities as well as the co-ordination of Estate development, which is funded through an Associations levy, of which all property owners are direct members. Tenants, neighbouring communities, visitors to the area and a wide range of other stakeholders are also beneficiaries of the activities of the association. 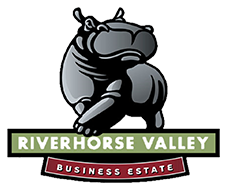 The Riverhorse Valley Business Estate Management Association is set up as registered Section 21 company (not for profit or gain), which is governed by the Companies Act 61/1973, and whose operation is legally bound by its registered Memorandum of Incorporation (MOI). Membership of the Association is entrenched in the property sales agreement of an area and therefore each property owner will automatically become a member of the Association on transfer of property, from which point the owner will also become liable to pay levies to the Association. The Board will usually appoint a management team, responsible for onsite operations and administration as well as overseeing the daily operations of all service providers, handling queries, coordinating meetings, collecting levies, financial management and development control. To achieve its purpose, the Association, under direction of its Board, provides a management structure and service providers in respect of security/safeguarding, landscaping maintenance, general maintenance, environmental management, design review and administration. Precinct Manager Bruce Macaulay manages this structure, with the support of Admin Officer Celine Spies. Employed by UrbanMGT (the company contracted to manage the RHVBEMA) Bruce and Celine work with various support staff, service providers, contractors, and the City to ensure the Estate meets optimal management levels. Maintaining communications between parties that financially contribute to the management association ensuring that all complaints / concerns are addressed effectively. Interaction with City Departments to increase Municipal service levels, and where necessary to lobby on behalf of members on issues or requirements which are in the public interest. Liaison between local communities and the City, and, where possible, involvement in projects with our surrounding communities that are deemed to be socially and environmentally sustainable. The Riverhorse Valley Business Estate Management Association (RHVBEMA) is set up as registered Section 21 company and as such, its’ operation is legally bound by its registered Memorandum of Incorporation (MOI).